Steam Explosions, Earthquakes, and Volcanic Eruptions—What’s in Yellowstone’s Future? Yellowstone, one of the world’s largest active volcanic systems, has produced several giant volcanic eruptions in the past few million years, as well as many smaller eruptions and steam explosions. Although no eruptions of lava or volcanic ash have occurred for many thousands of years, future eruptions are likely. 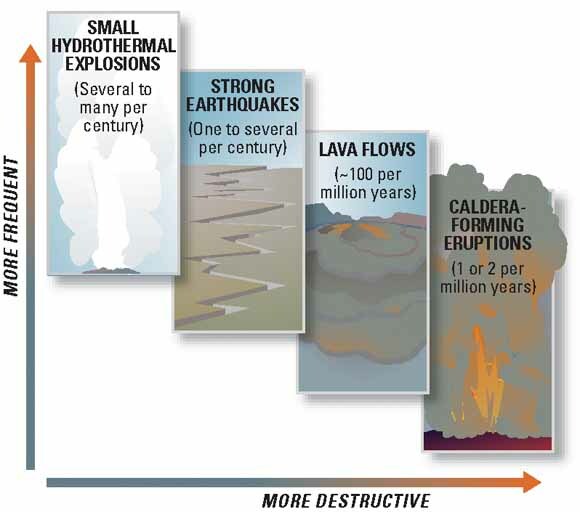 In the next few hundred years, hazards will most probably be limited to ongoing geyser and hot-spring activity, occasional steam explosions, and moderate to large earthquakes. To better understand Yellowstone’s volcano and earthquake hazards and to help protect the public, the U.S. Geological Survey, the University of Utah, and Yellowstone National Park formed the Yellowstone Volcano Observatory, which continuously monitors activity in the region. Each year, millions of visitors come to admire the hot springs and geysers of Yellowstone, the Nation’s first national park. Few are aware that these wonders are fueled by heat from a large reservoir of partially molten rock (magma), just a few miles beneath their feet. As this magma-which drives one of the world’s largest volcanic systems-rises, it pushes up the Earth’s crust beneath the Yellowstone Plateau. Stresses in the crust produce movements on faults, causing earthquakes to occur. Thousands of small quakes are recorded each year by the seismographic network of the Yellowstone Volcano Observatory (YVO), a partnership of the U.S. Geological Survey (USGS), the University of Utah, and Yellowstone National Park. Faults and fractures also allow surface water to penetrate to depth and become heated, rising again to produce hydrothermal (hot water) features, such as geysers. Steam and hot water carry huge quantities of thermal energy to the surface from the magma chamber below. Continuing up-and-down ground motions on the Yellowstone Plateau reflect the migration of both hydrothermal fluids and magma below the surface. Ground motions, earthquakes, and hydrothermal activity are all current manifestations of volcanic activity at Yellowstone. In the not-so-distant geologic past, Yellowstone has produced many major volcanic eruptions, which have repeatedly reshaped its natural wonders. The region’s most recent caldera-forming eruption 640,000 years ago created the 35-mile-wide, 50-mile-long (55 by 80 km) Yellowstone Caldera. 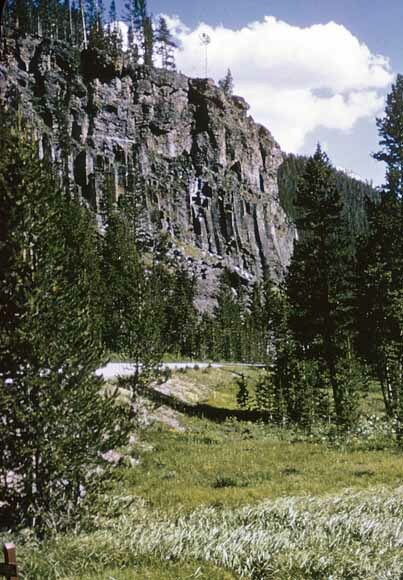 Pyroclastic flows from this eruption left thick volcanic deposits known as the Lava Creek Tuff, which can be seen in the south-facing cliffs east of Madison, where they form the north wall of the caldera. 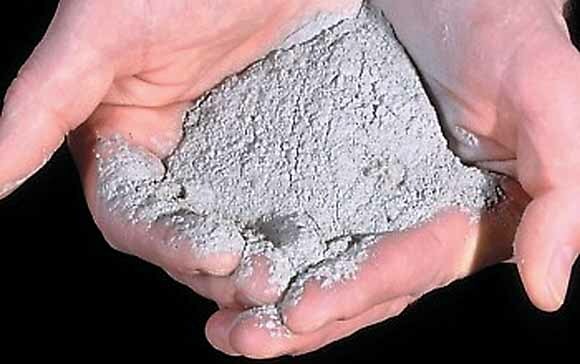 Huge volumes of volcanic ash were blasted high into the atmosphere, and deposits of this ash can still be found in places as distant from Yellowstone as Iowa, Louisiana, and California. Each of Yellowstone’s explosive caldera-forming eruptions occurred when large volumes of “rhyolitic” magma accumulated at shallow levels in the Earth’s crust, as little as 3 miles (5 km) below the surface. This highly viscous (thick and sticky) magma, charged with dissolved gas, then moved upward, stressing the crust and generating earthquakes. As the magma neared the surface and pressure decreased, the expanding gas caused violent explosions. 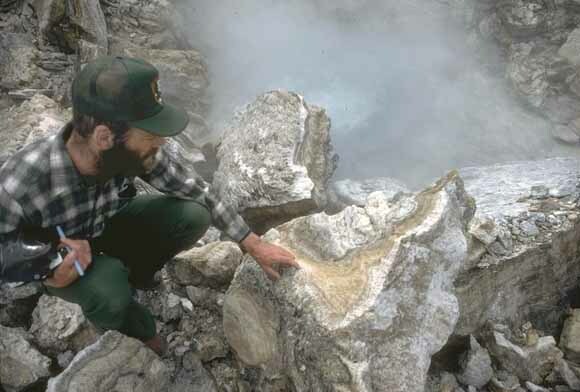 Eruptions of rhyolite have been responsible for forming many of the world’s calderas, such as those at Katmai National Park, Alaska, which formed in an eruption in 1912, and at Long Valley, California. More likely in Yellowstone than a large explosive caldera-forming eruption is eruption of a lava flow, which would be far less devastating. Since Yellowstone’s last caldera-forming eruption 640,000 years ago, about 30 eruptions of rhyolitic lava flows have nearly filled the Yellowstone Caldera. Other flows of rhyolite and basalt (a more fluid variety of lava) also have been extruded outside the caldera. Each day, visitors to the park drive and hike across the lavas that fill the caldera, most of which were erupted since 160,000 years ago, some as recently as about 70,000 years ago. These extensive rhyolite lavas are very large and thick, and some cover as much as 130 square miles (340 km2), twice the area of Washington, D.C. During eruption, these flows oozed slowly over the surface, moving at most a few hundred feet per day for several months to several years, destroying everything in their paths. Yellowstone is home to one of the world’s largest active volcanic systems. 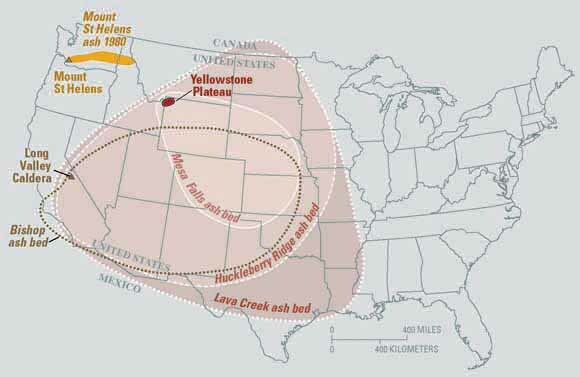 Cataclysmic eruptions in the past few million years created huge volcanic depressions called “calderas.” The youngest, the Yellowstone Caldera, was formed 640,000 years ago. Since then, about 80 eruptions of rhyolite (thick, sticky lava) and basalt (more-fluid lava) have occurred. The caldera’s interior is largely covered by rhyolites, most erupted in the past 160,000 years. Large hydrothermal (steam)-explosion craters formed in the past 14,000 years are located near Yellowstone Lake and in major geyser basins. 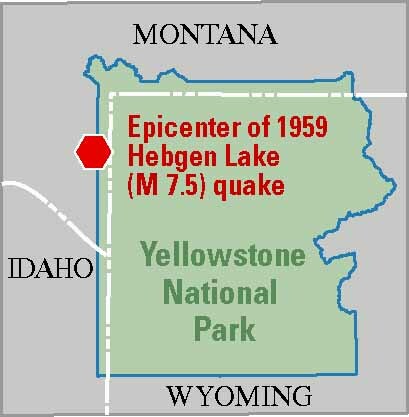 Recent earthquakes (1973 to 2002) were concentrated between Hebgen Lake and the Norris Geyser Basin and along faults. Today, most of the landforms within the Yellowstone Caldera reflect the shapes of these young lava flows. Cliffs surrounding the Upper Geyser Basin near Old Faithful Geyser are the cooled steep flow fronts of once-slow-moving rhyolite lavas. Some narrow ridges and valleys on the Canyon-Norris road are corrugations on the surface of a 110,000-year-old rhyolite flow. These roughly concentric ridges formed as the thick, pasty lava slowly oozed northeastward, wrinkling its surface. Within the caldera, rivers and streams commonly occupy the gaps between individual lava flows, and springs emerge at the edges of flows. Any renewed volcanic activity at Yellowstone would most likely take the form of such mainly nonexplosive lava eruptions. An eruption of lava could cause widespread havoc in the park, including fires and the loss of roads and facilities, but more distant areas would probably remain largely unaffected. Although some quakes are caused by rising magma and hot-ground-water movement, many emanate from regional faults related to crustal stretching and mountain building. For example, major faults along the Teton, Madison, and Gallatin Ranges pass through the park and likely existed long before the beginning of volcanism there. Movements along many of these faults are capable of producing significant earthquakes. The most notable earthquake in Yellowstone’s recent history occurred in 1959. Centered near Hebgen Lake, just west of the park, it had a magnitude of 7.5. This quake caused $11 million in damage (equivalent to $70 million in 2005 dollars) and killed 28 people, most of them in a landslide that was triggered by the quake. Even distant earthquakes can affect Yellowstone. In November 2002, the magnitude 7.9 Denali Fault earthquake struck central Alaska, 1,900 miles (3,100 km) northwest of Yellowstone. 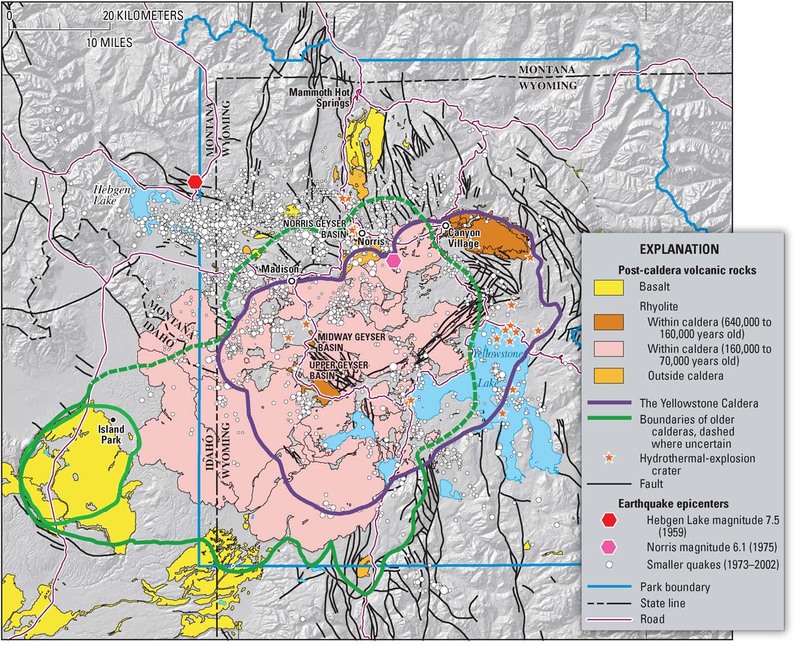 Because this quake’s energy was focused toward the active Yellowstone volcanic and hydrothermal system, it triggered hundreds of small earthquakes there. The region’s hydrothermal system is highly sensitive to quakes and undergoes significant changes in their wake. Earthquakes may have the potential to cause Yellowstone’s hot-water system to destabilize and produce explosive hydrothermal eruptions. 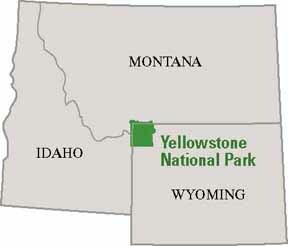 The Yellowstone National Park region produces about 2,000 earthquakes each year. Most of these quakes are too small to be felt, but they reflect the active nature of the region, one of the most seismically active areas in the United States. The most powerful earthquake in Yellowstone’s recent history occurred in 1959. This quake was centered near Hebgen Lake, just west of the park, and had a magnitude (M) of 7.5. 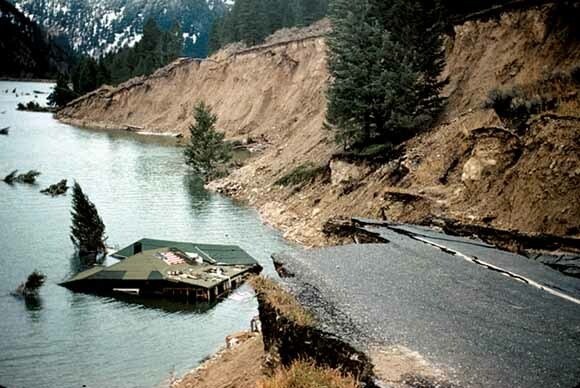 The Hebgen Lake earthquake killed 28 people-26 in a huge landslide triggered by the quake-and caused $11 million in damage (about $70 million in 2005 dollars). Numerous structures and roads in the region were severely damaged when hillsides collapsed, gaping cracks opened in the ground, and large blocks of rock were displaced. 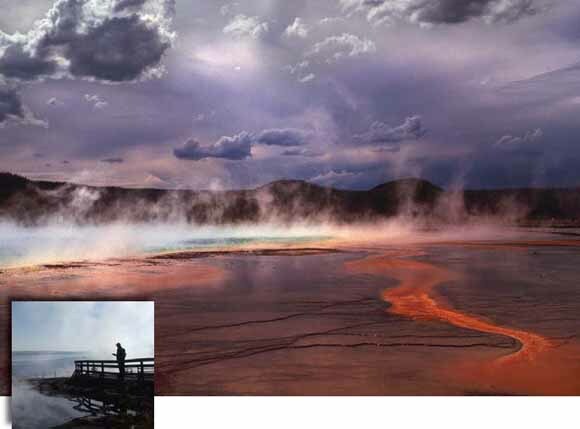 The Hebgen Lake quake caused widespread changes in Yellowstone-roads were closed throughout the area, some geysers stopped erupting, and others were newly formed or came back to life after years of dormancy. Also, the Old Faithful Inn was strongly shaken-pipes broke, a chimney collapsed, and the inn had to be evacuated. Although quakes of this magnitude are rare in the Yellowstone region, they are certain to occur in the future. To better understand this hazard and help protect the public, scientists of the Yellowstone Volcano Observatory (YVO) continually monitor the region’s seismic activity. Seismogram of the 1959 magnitude 7.5 Hebgen Lake earthquake recorded at Butte, Montana, about 100 miles from the epicenter. Geysers and hot springs are common expressions of a hydrothermal (hot water) system, but sometimes changes in “plumbing” result in large volumes of water suddenly flashing into steam, causing violent hydrothermal explosions. A large hydrothermal explosion can hurl water and rock thousands of feet and create new landscapes of hills and craters. In Yellowstone’s geologic past, hydrothermal explosions have occurred countless times. 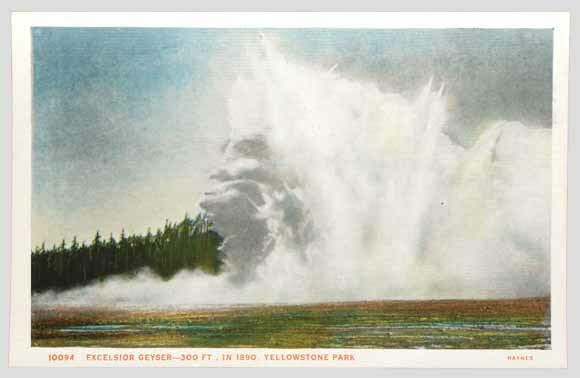 In 1881, Colonel Philetus W. Norris, Yellowstone National Park’s second superintendent, witnessed a spectacular hydrothermal explosion at Excelsior Geyser in the Midway Geyser Basin. He described the aftermath as follows: “The pool was considerably enlarged, its immediate borders swept entirely clear of all movable rock, enough of which had been hurled or forced back to form a ridge from knee to breast high at a distance of from 20 to 50 feet [ 6 to 15 m] from the ragged edge of the yawning chasm.” After a series of such explosions that ended in the early 1890s, Excelsior, once the world’s largest active geyser, became a quietly boiling hot spring. Except for several geyser eruptions in 1985, it has remained so ever since. A more recent hydrothermal explosion occurred in 1989 at Porkchop Geyser in Norris Geyser Basin. The remains of this explosion are still clearly visible today as a 15-foot (5 m)-diameter apron of rock debris surrounding Porkchop’s central spring. Much larger hydrothermal explosions have occurred at Yellowstone in the recent geologic past. The greatest concentration of hydrothermal-explosion craters lies around the north end of Yellowstone Lake. These craters owe their origins to spectacular explosions thousands of years ago. Eruptions of the Yellowstone volcanic system have included the two largest volcanic eruptions in North America in the past few million years; the third largest was at Long Valley in California and produced the Bishop ash bed. The biggest of the Yellowstone eruptions occurred 2.1 million years ago, depositing the Huckleberry Ridge ash bed. These eruptions left behind huge volcanic depressions called “calderas” and spread volcanic ash over large parts of North America (see map). If another large caldera-forming eruption were to occur at Yellowstone, its effects would be worldwide. Thick ash deposits would bury vast areas of the United States, and injection of huge volumes of volcanic gases into the atmosphere could drastically affect global climate. Fortunately, the Yellowstone volcanic system shows no signs that it is headed toward such an eruption in the near future. 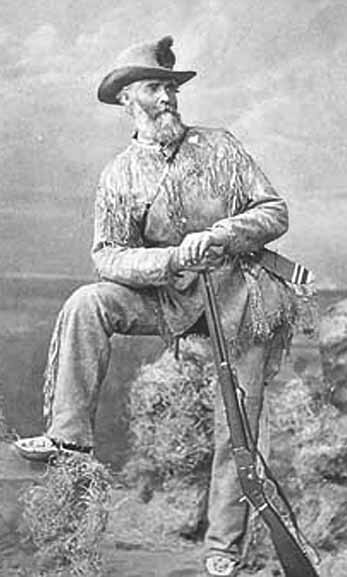 In fact, the probability of any such event occurring at Yellowstone within the next few thousand years is exceedingly low. 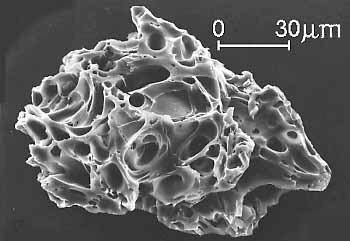 Volcanic ash, like this ash from the 1980 eruption of Mount St. Helens, is made up of tiny jagged particles of rock and glass. Even a light dusting of volcanic ash can pose a health hazard to people and animals and damage crops, electronics, and machinery. Heavy ash fall, such as that from a large caldera-forming eruption, would devastate the surrounding area and affected areas downwind. How Big Were the Yellowstone Eruptions? Explosive eruptions are best compared by recalculating the volume of erupted volcanic ash and pumice (see photos) in terms of the original volume of molten rock (magma) released (shown in this diagram by orange spheres). On this basis, the 585 cubic miles (mi3) of magma that was erupted from Yellowstone 2.1 million years ago (Ma) was nearly 6,000 times greater than the volume released in the 1980 eruption of Mount St. Helens, Washington, which killed 57 people and caused damage exceeding $1 billion. Even the 1815 Tambora, Indonesia, eruption—the largest on Earth in the past two centuries—was more than five times smaller than the smallest of Yellowstone’s three great prehistoric eruptions at 1.3 Ma. Scientists evaluate natural-hazard levels by combining their knowledge of the frequency and the severity of hazardous events. In the Yellowstone region, damaging hydrothermal explosions and earthquakes can occur several times a century. Lava flows and small volcanic eruptions occur only rarely—none in the past 70,000 years. Massive caldera-forming eruptions, though the most potentially devastating of Yellowstone’s hazards, are extremely rare—only three have occurred in the past several million years. U.S. Geological Survey, University of Utah, and National Park Service scientists with the Yellowstone Volcano Observatory (YVO) see no evidence that another such cataclysmic eruption will occur at Yellowstone in the foreseeable future. Recurrence intervals of these events are neither regular nor predictable. None of the events described above—cataclysmic caldera-forming eruptions, lava flows, large earthquakes, or major hydrothermal explosions—are common in Yellowstone. Although visitors to Yellowstone National Park may never experience them, some hazardous events are certain to occur in the future. Fortunately, systematic monitoring of Yellowstone’s active volcanic and hydrothermal systems, including monitoring of earthquakes and ground deformation, is now carried out routinely by YVO scientists. This monitoring will allow YVO to alert the public well in advance of any future volcanic eruptions. Currently the ability to reliably predict large quakes or hydrothermal explosions, events more likely than a volcanic eruption, remains a challenge. However, changes in the patterns of ongoing seismicity or other indicators of possible geologic unrest are quickly reported to officials responsible for public safety in the National Park Service and other agencies. Through continuous monitoring and research, YVO is greatly improving understanding of Yellowstone’s volcanic, earthquake, and hydrothermal hazards. The work of USGS scientists with YVO is only part of the USGS Volcano Hazards Program’s ongoing efforts to protect people’s lives and property in all of the volcanic regions of the United States, including California, Hawaii, Alaska, and the Pacific Northwest. Increased scientific surveillance of Yellowstone in the past 30 years has detected unmistakable changes in its vast underground volcanic system, similar to historical changes observed at many other large calderas (volcanic depressions) in the world. To strengthen the capabilities of scientists to track and respond to changes in Yellowstone’s activity, a fifth U.S. volcano observatory was created in 2001, complementing existing ones for Hawaii, Alaska, the Cascades, and Long Valley, California. The Yellowstone Volcano Observatory (YVO) is supported jointly by the U.S. Geological Survey, the University of Utah, and Yellowstone National Park. 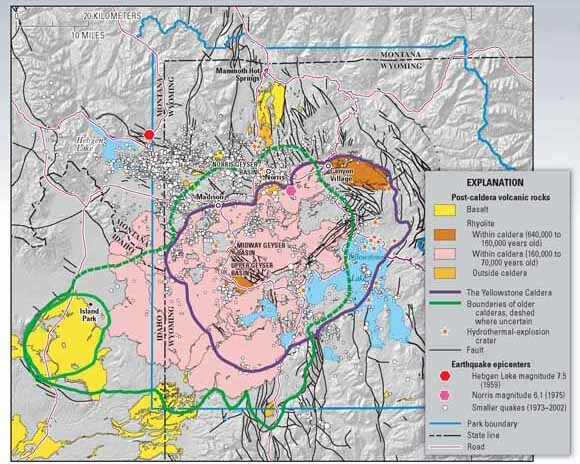 Communicating new scientific results, the current status of Yellowstone’s activity, and forecasts of potential hazardous hydrothermal explosions or volcanic eruptions to Yellowstone National Park staff, the public, and local, State, and Federal officials. Current real-time-monitoring data are online at http://volcanoes.usgs.gov/yvo/monitoring.html. Go to the Press-images folder to get publication-quality versions of the images for use by, for instance, the media (14 images totaling 59.2 MB).